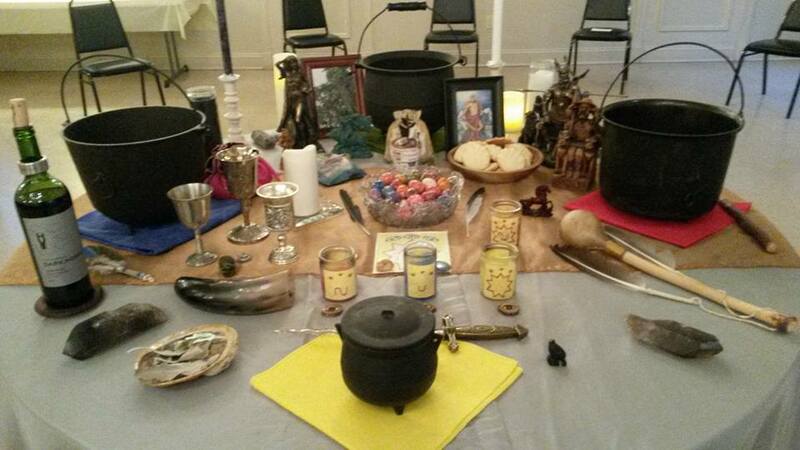 The Spirit’s Edge Shamonial Temple had its in-person Ostara / Spring Equinox Ritual and Salon on Sat., March 25, 2017. While this online version is a greatly pared down version of our in-person ritual, it is powerful in its own right and will connect you with the greater workings of our Temple. Everyone is also welcome to join our Spirit’s Edge: A Seeker’s Salon group page and “like” and follow us on our Temple’s Facebook page, where you can see all of the pictures, discussions and also easily access our event pages. All are welcome to join! 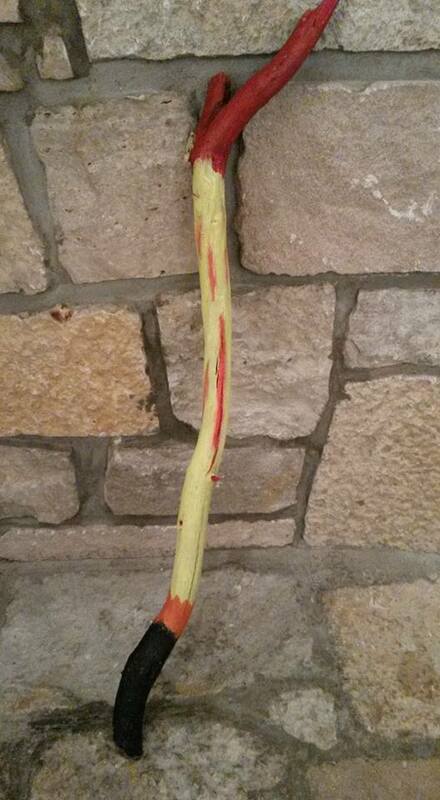 The day of our Ostara ritual, we held our second ever Pre-Ritual Crafting Workshop – Craft Your Own Spear of Destiny before the ritual, where those attending crafted their own “Spear of Destiny” also known as a wand or staff. A Spear of Destiny directs your True Will and is one of the Hallows. It was such fun! The quiet and relaxing setting was perfect for our afternoon workshop and the gorgeous and large space was perfect for our rituals and community fellowship afterwards. There was sunshine followed by a gentle spring rain before the air cooled a little into a gorgeous spring evening! Ostara is a time of rebirth and renewal. We held our ritual during the Dark of the Moon. The New Moon in Aries is Mon., March 27, 2017 at 9:57 p.m. Timing your own personal ritual with the New Moon would be lovely, or today, Sunday, as Sundays are great for new beginnings, prosperity and success. Aries is also the beginning of the cycle – the first sign of the Zodiac on the Zodiacal Wheel of the Year. 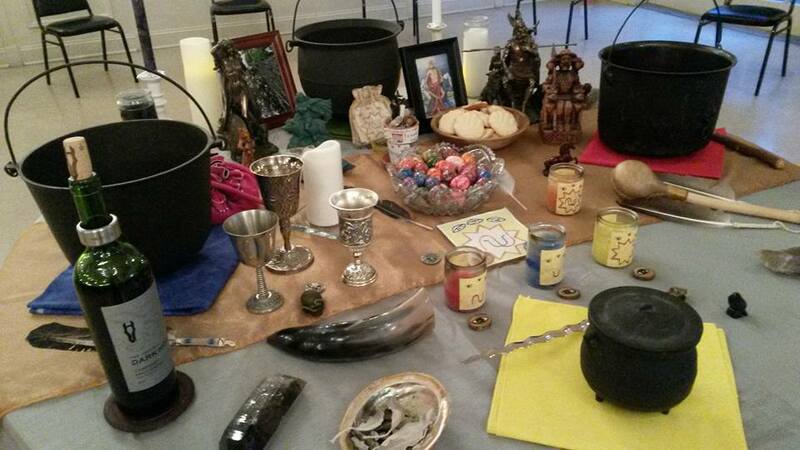 Our ritual is a Ritual of Balance where we journeyed to the Crossroads of the Elements. We partnered with Frigga as the Goddess of Earth; Freya as the Goddess of Fire; Odin as the God of Air; and Frey as the God of Water. Freya and Odin are Guardians in the Temple of the Twelve Signs, Guardians of the Spirit’s Edge Shamonial Temple and Tradition. We worked with the alchemical orientation of the elements, with Fire in the East and Air in the South. Also, the Spear of Destiny/ wand/staff in our working is associated with Fire. We called to the Nine Worlds of Norse mythology, particularly focusing on three of the worlds corresponding to the Three Worlds. We worked with the great tree Yggdrasil as our journey vehicle. Each ritual attendee received a token of our ritual – a Pysanky egg donated by Temple High Priestess Shea Morgan and charged with the energy of our working. They were handcrafted/painted in the Ukraine. Eggs represent fertility and rebirth and also the three layers reflect the three cycles of life – death, life and rebirth – and also the three phases of womanhood or of the Goddess – maiden, mother, and crone. 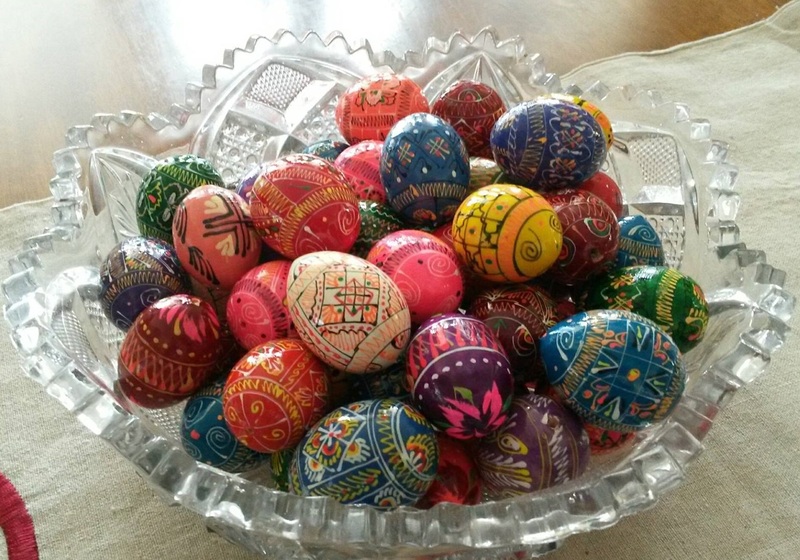 The Pysanky eggs were handed down, and still are, for blessings, prosperity, luck, protection, and were often placed in a bowl within the home – and quite simply, they are a bowl of happy! Frigga is the matriarch of the Norse Gods, ruling the pantheon behind the scenes as a strong matriarch of the household would do. 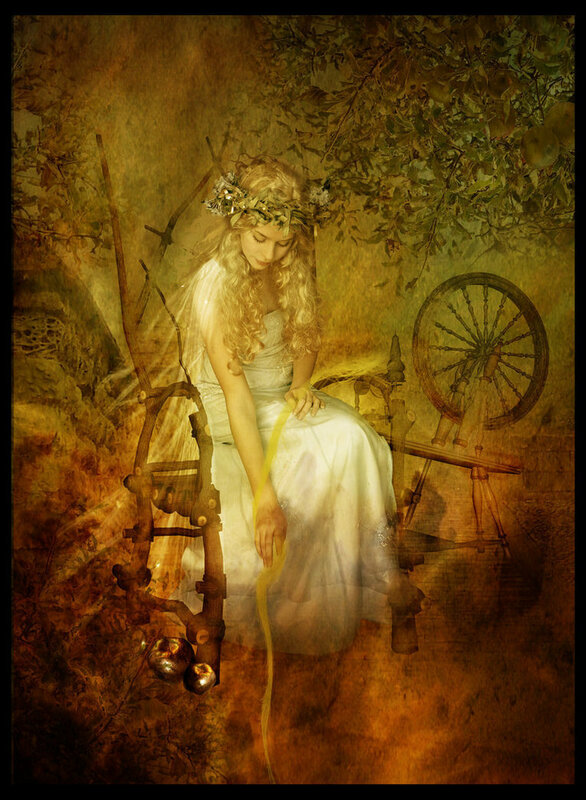 Freya is a Goddess of Love and War, and also of healing and prosperity. She is associated with cats. 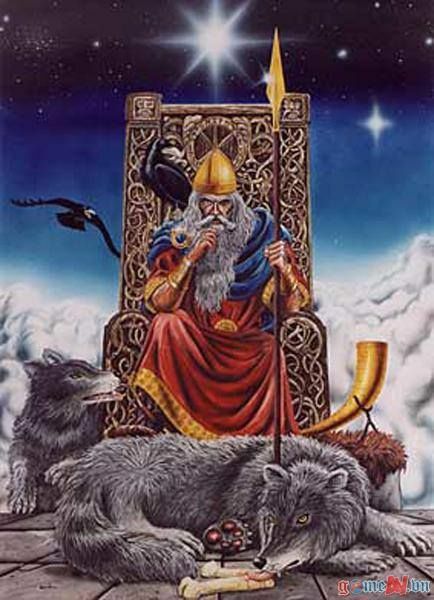 Odin is a father God, intellectual, strong, wise, father of the Runes. He has two ravens – one on each shoulder. 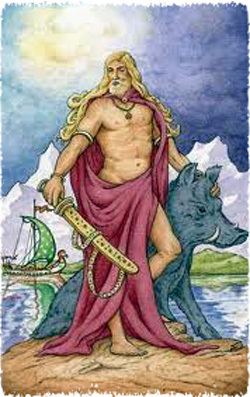 Frey is a God of Love, Peace, Prosperity and Fertility, associated with both water/the rains and the Sun. Together they are a formidable group of Gods, and we were honored to have them in our presence and to bless our working! And they in turn had a grand time! So say we all! You are welcome to perform your ritual at any time, and it will tie into the main working of our Temple’s Ritual. The New Moon in Aries is Mon., March 27, 2017 at 9:57 p.m. Timing your own personal ritual with the New Moon would be lovely, or today on the New Moon Eve, Sunday, as Sundays are great for new beginnings, prosperity and success. Aries is also the beginning of the cycle – the first sign of the Zodiac on the Zodiacal Wheel of the Year. An image of an egg, or an actual egg. You may wish to boil an egg and use it for this working. Then after the working, you may either consume the egg to bring its blessings within you, or offer the egg to the Earth/land. Or you may do both, so that you may still retain an image or other egg symbol or other magickal token (if you prefer) as a symbol or token of the working. … On our Spirit’s Edge: A Seeker’s Salon group page, we will offer the hand-painted Ukranian Pysanky wooden eggs for sale, charged from the power of our in-person ritual if you would like as well. You may then transfer the “charge” of your own personal working from your symbol to that egg later. Prepare your altar space with your images of the four Gods and your four candles. Then prepare yourself and your space according to your preference. You may cast a circle and call the quarters if you would like, but it is not necessary. Hail Frigga! Goddess of the Earth! Mother to Balder! Blessed Mother to all! Queen of Asgard! 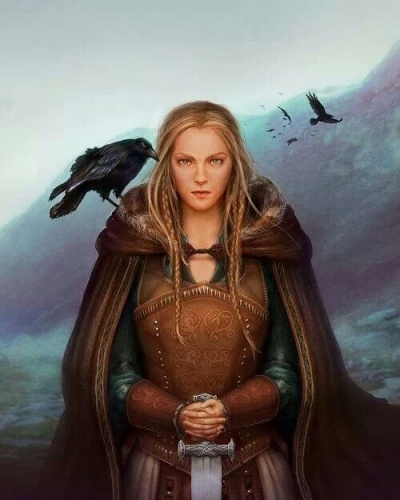 Great Wife of Odin! Mother of the Gods! Charging and filling our own Spears of Destiny with its power. Hail Freya! Goddess of Healing, Love and Fertility! Yet also, Great Goddess of War! Warrior, lover and healer as one. Two halves of the whole – complete, one. In balance. And lend its brightness and power to our working tonight. Hail Frey! God of love and lust! God of the folk! God of the worlds! Rider of Boar and master of the might of the wild stallion! Brother of Freya! God of the Waters! Let our souls feel the love within your heart. We turn the wheel at Ostara, bringing in the healing light of the Sun to cleanse, balance and center ourselves – mind, body and spirit. We begin our growth anew, and we transform our lives through our will, in balance with our True Will, taking root in the blessings of the fertile Earth. We stand refreshed in the gentle Spring rains. We reach out to turn the wheel of life today and accept the Blessings and Balance of Spring with gratitude. We honor and thank the Lady Ostara, whose messengers of Spring are all around us. We honor and thank Frigga of the Earth, Odin of the Air, Freya of Fire and Frey of Water for balance in our life, for their blessings tonight and for all of the blessings on our journey. Blessed be. You may wish to meditate with Frigga, Odin, Freya and Frey. You may use one of the candles, watching it grow bigger in your mind’s eye. And as the light grows, enter the light and journey where it takes you. You may wish to meditate first with one of the four, using their candle, and then the others. Or you may wish to see which one of the four candles – the four elements – calls to you. Meditating on the elements and your balance with the elements and journaling on that is also recommended. You may also hold the intention to journey through the Great World Tree, through Yggdrasil, to the Lower World/Underworld, with the intention of finding the pathway from your inner sacred space to the Crossroads of the Elements. From there, see which elemental guide or deity approaches and communes with you. With the Spring’s arrival, what do you wish to grow in your life? What rebirth do you seek? What blessings do you wish to flourish? What does this time of Ostara mean to you? How do the Norse Gods and their energy call to you or resonate with you? How are you in balance with the four elements? Do you have too much of one and not enough of the other? How might you work with the other elements to compensate or balance the element that you have too much of? How might you add more of one element in your life if you do not have enough of it? Take your egg or symbol, and hold it in your hands. Now is the time to build power and charge your egg. You will charge it with the energy of your working, the messages you received, the power of the Norse Gods, the power of your true Will and the energy as you read this chant. It does not have a tune – simply saying the words or calling them out over and over until you feel the power has built is perfect. Shea wrote this simple chant, and we built a great deal of power working with it – you can too! At this time you may choose to speak words of love and gratitude to the Norse Gods. When you feel you are finished, thank the spirits for their presence in your space and wish them farewell. Then close your circle according to your own tradition. Either consume your egg if you worked with a hard-boiled egg, or place your egg/symbol/token in a sacred place, such as on your altar or make it a part of your home shrine (shrine to the spirits of the place, the home, the land). Frigga! Hail to Odin! Hail to Freya! Hail to Frey! Blessings to and of the Norse Gods! Blessed be! 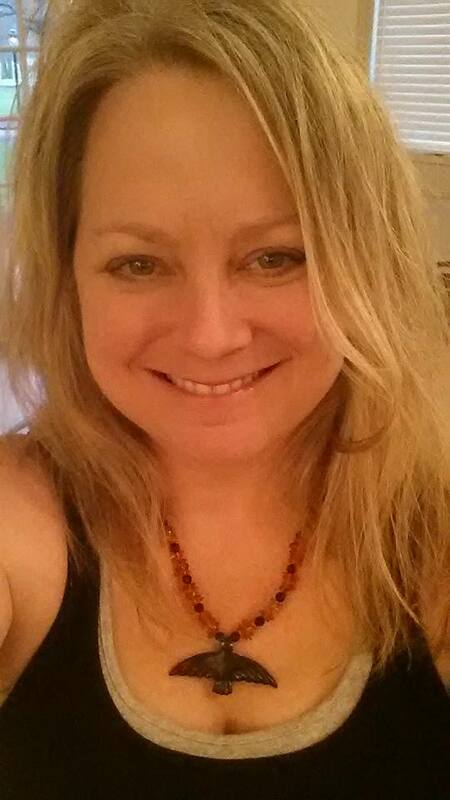 Written by Temple High Priestess Shea Morgan, with Love and Magick! copyright 2017; all rights reserved … This ritual was written by Temple High Priestess Shea Morgan, unless noted otherwise, and all rights are reserved. It may be used for your personal/private use only. If you wish to use this or a variation for a group in the future, please contact Shea Morgan for the Spirit’s Edge Shamonial Temple at ravins52252@mypacks.net for permission; this ritual may not be published or used publicly elsewhere without prior written permission and attribution.